Disclosure: I was compensated monetarily for this sponsored post by Egg Farmers of Canada. All opinions and experiences are my own. Always in a hurry in the morning? If you do a little bit of prep the night before then breakfast is a snap to make and super delicious too. 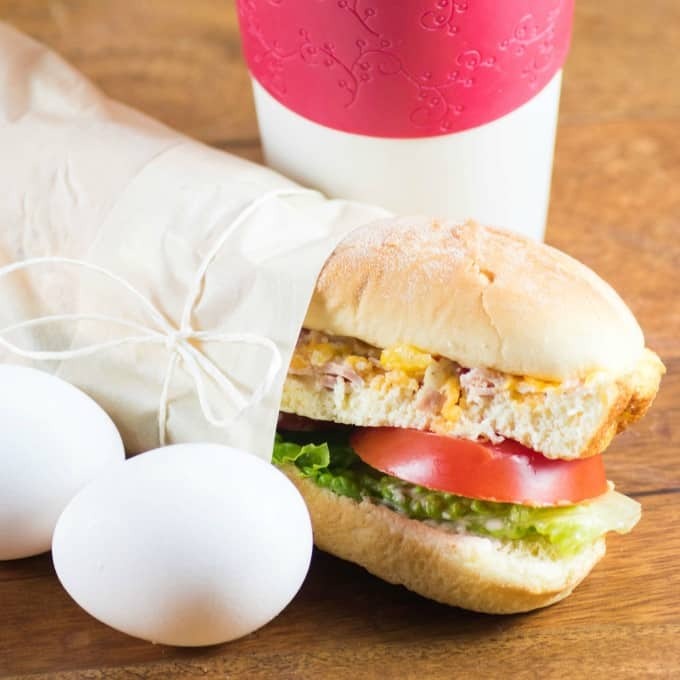 This Breakfast Sandwich to Go is loaded with the goodness of eggs! Today we are part of a global celebration dedicated to eggs, Happy World Egg Day!! Come and celebrate World Egg Day with your friends and family by enjoying some of your favorite egg dishes. Eggs carry you from morning to night with delicious meals!! An oven omelet is super easy to make. Eggs are whipped up with thin sliced ham, peppers, cheese, salt and pepper and popped into the oven to bake. Let this cool down, then cover with plastic wrap until the morning. You have a delicious fluffy egg waiting for you to slide into a soft fresh bun with your favorite toppings and you are off and running in a matter of minutes!! Canadian eggs are produced in every province by more than 1,000 farm families. No matter where in Canada, even the Northwest Territories when you purchase eggs they are from a local farmer. 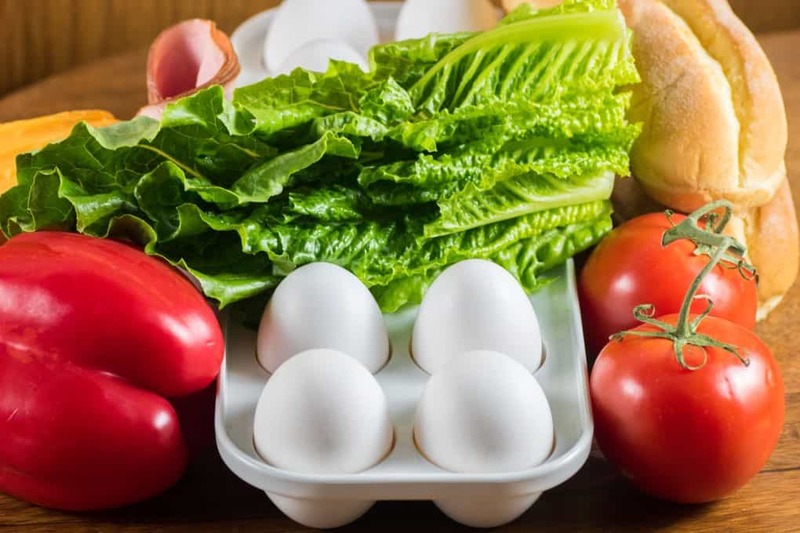 On average it takes less than a week for eggs to travel from the farm to the grocery store, ensuring you get fresh wonderful eggs every time. Canadian egg farms are family run over generations. These families take pride in producing eggs for Canadians to enjoy. Fresh eggs, produce, bread, cheese and ham make the best Breakfast Sandwich To Go ever!! Making it homemade doesn’t even compare to a fast food restaurant. Although I did get the inspiration from a fast food chain for the sandwich as it is one of my daughter’s favorite subs! My daughter and myself were honored to see first hand how Canadian farmers take great pride in providing exceptional care for their hens. This in turn produces the highest quality for Canadian families to enjoy. Canadian eggs are always clean and fresh because egg farmers in Canada all adhere to the same National Animal Care and food-safety programs. This ensures that the hens are well cared for. Egg farmers in Canada are proud to provide Canadians with fresh, local eggs. 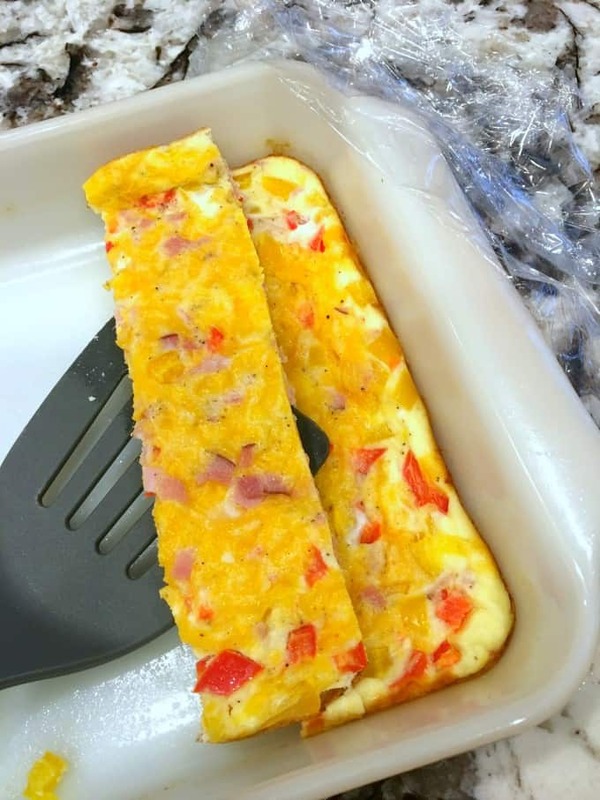 Baking up the oven omelet in an 8×8″ pan gives you four generous portions for you and your family for breakfast! Making the eggs like this leaves them tender and moist for warming up the next day. Egg and cheese is a delightful combination and then the added ham and peppers. If you want to add in your own touch that would work too. Other veggies like spinach, onion, broccoli, asparagus would all work great too. Crumbled bacon would be a delicious addition also. Nothing can be more quick and easy than this gorgeous sandwich. It is the perfect way to start off a good day! How will you be eating eggs to celebrate World Egg Day today? Share your favorite egg dishes on all social changes using the hashtag #WorldEggDay!! 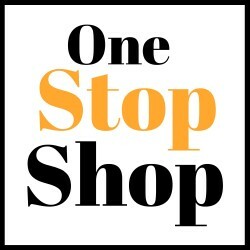 Follow along on Twitter, Instagram and like their Facebook page Get Cracking! For more information visit eggfarmers.ca or for recipes and nutrition visit eggs.ca. According to Canada’s Food Guide two eggs equal one serving of meat. One large egg has 70 calories and 5 grams fat. Eggs are loaded with nutrients like vitamins A, D, B12 and E. Plus folate, iron, zinc and choline. Pretty amazing that one egg can contain that much nutrition!! Eating eggs is good for your bones, teeth, skin and eyes. They also provide 6 grams of high quality protein and half that protein is in the yolk so don’t skip it! They are a complete protein because they contain all nine of the essential amino acids. Brown and white eggs contain the same amount of nutrition. Eggs just don’t have to be for breakfast of course they are a very versatile ingredient in many dishes. Start off a brunch with stuffed crepes or a frittata or quiche for dinner and then finish off with a gorgeous impossible coconut pie. These are just a few dishes to name. So come and celebrate #WorldEggDay with us! There is a lot to celebrate in this package!! 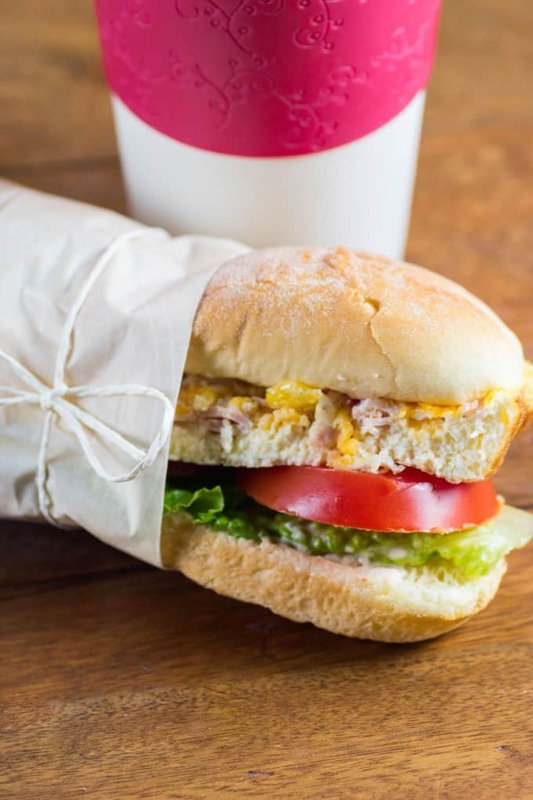 Try our easy and nutritious Breakfast Sandwich To Go today! Or make up some to share with the family over the weekend and into next week. You can’t find a more delicious sandwich to start your day. I add a little creaminess to the sandwich too with mayonnaise and there you go more eggs in mayo too! Enjoy your eggs and have fun celebrating! 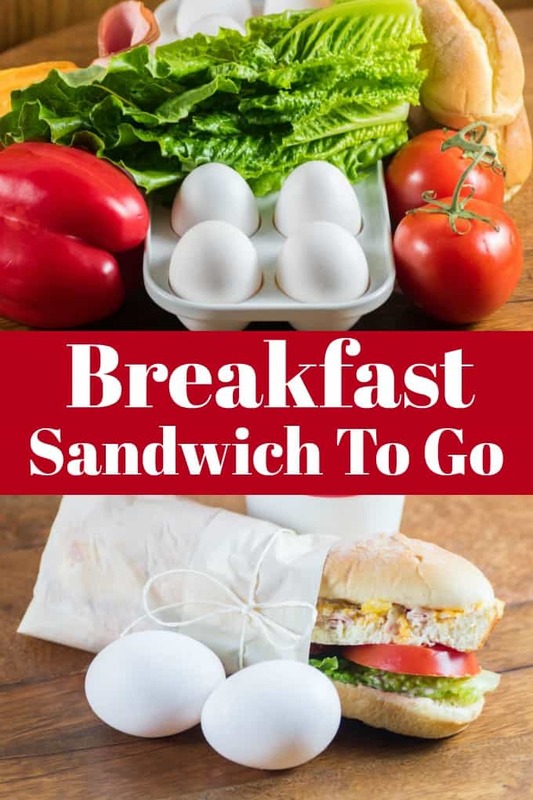 This easy Breakfast Sandwich To Go will have you starting the day off right! Make the oven omelet the night before and this will take you minutes to pull together in the morning. Spray an 8x8" dish and set aside. In a medium sized bowl whisk the eggs well. Add in the milk, cheese, ham, peppers, salt and pepper and mix. Pour into the prepared dish and bake for 30 min. or until cooked through, lightly browned and set in the middle. If making the night before, let cool and cover with plastic wrap and refrigerate. Last for 3-4 days in the fridge. Cut the omelet into 4 strips and place inside the sausage rolls with mayonnaise, lettuce and sliced tomatoes. 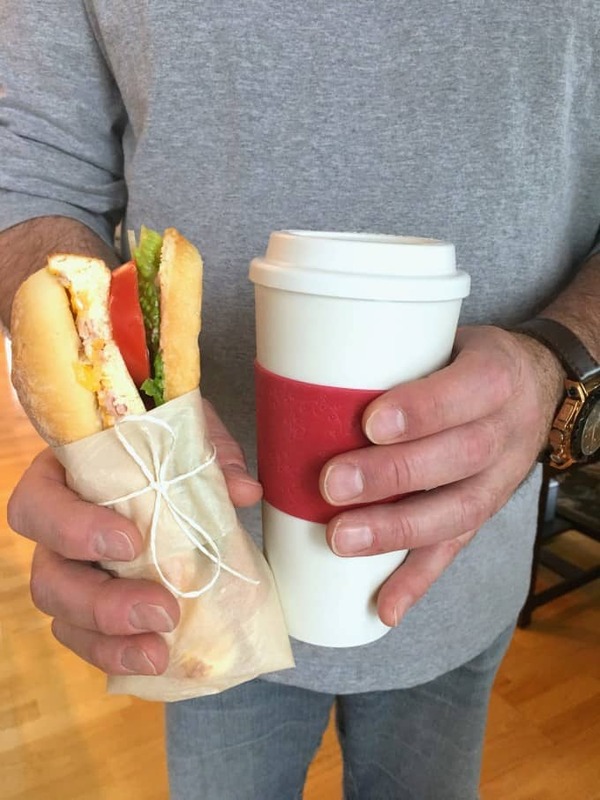 Wrap the sandwich up and take it to go! Wow, I’m loving this as a complete breakfast idea. Having some ready for everyone before they go to work would be perfect. That is pure genius! This is the best breakfast sandwich I’ve ever seen. I love your recipes! 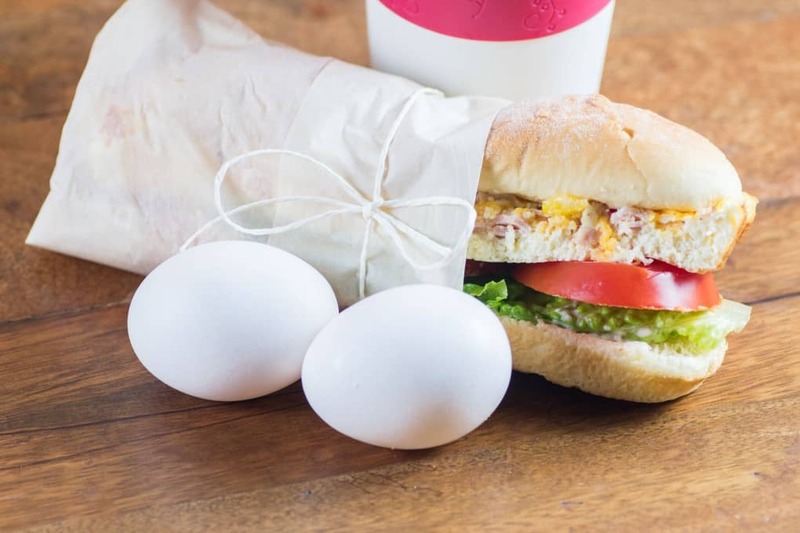 This is such a clever idea for like egg subs! I have never “baked” eggs but I need to try it out. Good gracious! That is one amazing breakfast right there! I would totally eat that for every meal, not just in the morning! This sandwich is so flavorful. I love that it has everything we love to eat for breakfast! Yummy! OH that is one beautiful looking breakfast sandwich!!! Never had one on a roll like that before! It looks awesome. I like that I don’t have to have it on bread if I don’t want. It is perfect. I love this idea!!! 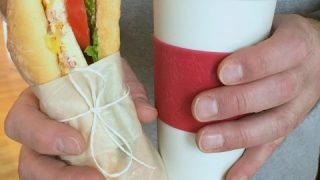 Making the sandwiches seem really easy and perfect for busy days. Funny because my youngest just asked for hard boiled eggs, and writing this Im going to go start them. Thanks for the reminder! This is a great idea! Perfect for my sons for their breakfast on the go. I will save the recipe and make this for their breakfast tomorrow.